If you can remember ever having to run stairs during high school football or track practice, you know that it’s no joke. It’s a tough, intense workout that exercises nearly every muscle in your body. Even though it doesn’t directly target the abdominal muscles, running stairs can help you burn belly fat, and fast. It’s a type of high intensity interval training, or HIIT, which studies have shown is effective at helping to burn away belly fat more efficiently than traditional steady-state exercise, such as jogging. Several studies have shown HIIT is effective at burning subcutaneous and visceral fat – the fat just below your skin and the stuff deep within your abdomen, respectively. A review published in the Journal of Obesity in 2011 investigated several of these. The evidence showed that abdominal fat was reduced by as much as 48% after eight weeks of HIIT. Other studies found participants lost anywhere from six percent to 44 percent belly fat doing a similar type of HIIT regimen. So results can vary, but the moral of the story is that yes, you can lose belly fat by running stairs. To maximize your fat loss results, it’s important to design your stair workout around the general guidelines of HIIT. First off, it’s best if you can use a large set of stairs, 30 or more works well. If not, try to at least find a set of 10 or more stairs. After warming up for about five minutes by doing some light jogging and stretching, prepare to work hard. Sprint up the stairs at near maximal speed and then walk back down the stairs. It’s about a 3:1 ratio between recovery and sprinting. For example, you sprint for 10 seconds up the stairs and walk back down for 30 seconds before sprinting back up. Do this recover-and-sprint cycle at least 10 times per workout. If it seems too intense, walk the stairs as fast as possible instead of sprinting. A 200-pound person burns about 550 calories per 30 minutes of running stairs at a fast pace. This can vary depending upon your intensity level and number of stairs you’re running. Just in terms of calories burned, this example would lead to nearly a one pound loss of weight every two weeks assuming three 30-minute workouts per week. But looking exclusively at the number of calories burned with this workout would be selling it short. The other benefits of HIIT include improved insulin sensitivity, hormonal response and increased fat oxidation. These are all beneficial when it comes to burning excess belly fat. Before tackling a huge set of stairs like you’re Rocky training for his next fight, it’s important to get a little practice running stairs at a smaller scale. One way to do so is by using a stair stepper machine at the gym. It simulates running stairs, and you can get a good workout doing so at a more moderate pace. You can also try running stairs in your home or at your apartment if they’re between 10 and 15 steps. Start slow and work your way up to a near dead sprint over a period of weeks. If you experience knee pain, you should stop and consult your physician. 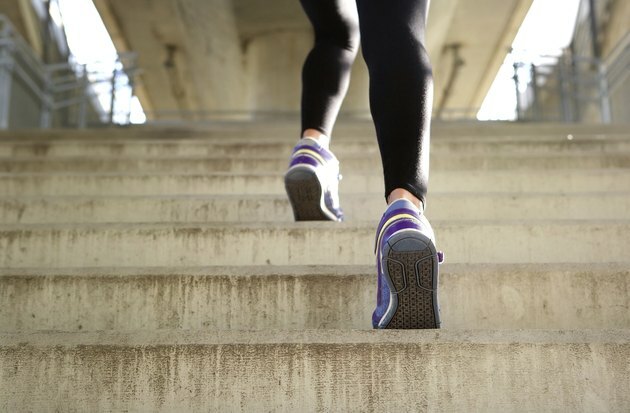 Running stairs isn’t a low-impact exercise, so it’s not right for everyone. If it is right for you, have fun trimming your waistline one step at a time. Burning Belly Fat: Run or Walk?